From managing files on your phone to seamlessly syncing folders with your computer, this guide will turn you into a certified Android file master. When you think about your smartphone, apps and interfaces are probably the first things that come to mind. Beneath all that surface-level stuff, though, our modern mobile devices are filled with files — folders upon folders of 'em! — just like the clunky ol' computers we've relied upon for ages. We may not come face to face with our phones' file systems too often, but it's valuable to know they're there — and to know how they can work for us when the need arises. After all, your Android device is a productivity powerhouse. It can juggle everything from PDFs and PSDs to presentations and podcasts. It can even act as a portable hard drive and house any sort of important files you might need in your pocket (and not just on some far-away cloud). Your mobile device can carry an awful lot of data, and there may come a time when you want to dig in and deal directly with it. Here's everything you need to know to get under the hood and tap into your phone's file managing powers. You might not realize it at a glance, but Android actually allows you to access a device's entire file system — even from the device itself. The operating system has had its own native file manager since 2015's Android 6.0 Marshmallow release, and what started out as an experimental-seeming effort has evolved into a capable tool for basic data manipulation. With Android 6.0 through 7.1, the system-level file manager is somewhat hidden: You have to look in the Storage section of your system settings, then scroll all the way to the bottom and tap the line labeled "Explore" to find it. With Google's Android 8.0 Oreo release, meanwhile, the file manager lives in Android's Downloads app. All you have to do is open that app and select the "Show internal storage" option in its menu to browse through your phone's full internal storage. You can then open, move, rename, copy, delete and share files as needed. 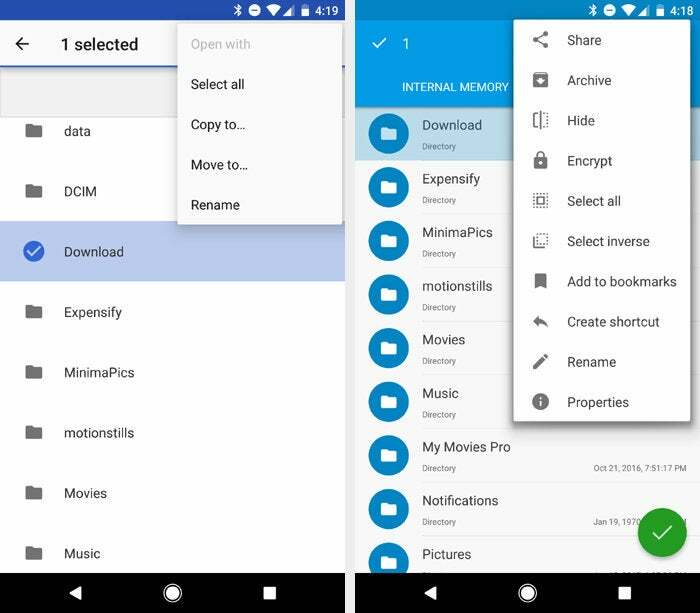 Android's native file manager (left) is fine for basics, but a fully featured app like Solid Explorer (right) can do much more. If you want to do more than the most basic on-device file management, a third-party file manager is the way to go. I like Solid Explorer, which costs a meager $2 after a two-week trial. It's nicely designed and intuitive to use, yet jam-packed with advanced features like near-instant device-wide searching, support for creating and extracting common archive formats (such as ZIP, 7ZIP and RAR), and the ability to encrypt files and folders so they're accessible only with a fingerprint or password. 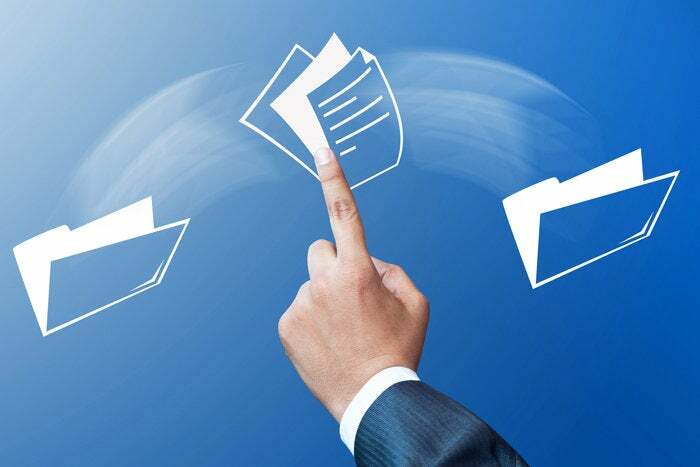 Solid Explorer can connect to almost any cloud storage service as well as to a personal or corporate FTP server for hassle-free transferring of local and remote files. Be sure to turn your phone horizontally, too, as that'll cause the app to expand into a multi-window mode in which you can easily drag and drop files between two different folders or destinations. A fair number of devices, including Google's Pixel phones and many Samsung Galaxy products, offer such support. If you aren't sure if your phone does, your best bet is to Google its name along with "USB OTG"; odds are, you'll find the answer fairly quickly. Provided your device supports USB OTG, all you need is a USB-A to USB-C adapter like this one made by Amazon. (If you have an older device that doesn't have USB-C, you'll need a USB-A to micro-USB adapter instead; you can find plenty such options on Amazon or at pretty much any electronics retailer.) 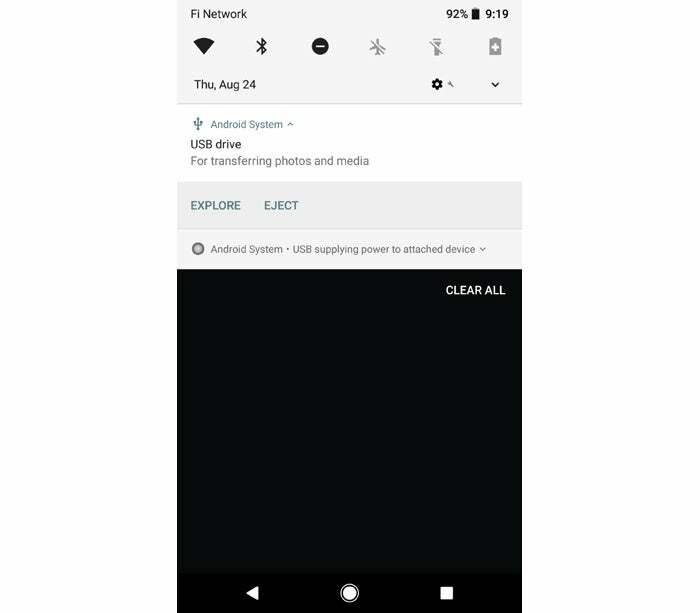 Use the adapter to plug the external drive into your phone, then look for a notification confirming the drive is connected. Tap the "Explore" option within the notification, and that's it: You can now browse and access all the files on your external drive. If you want to do even more, just open up a third-party file manager like the aforementioned Solid Explorer. You'll be able to find the USB drive there and perform most any imaginable function on its contents. When you're finished, don't forget to go back to the notification and tap "Eject" before disconnecting the drive. With a Windows system, it's essentially as simple as plug and play. With a Mac, you'll first need to install a special program on your computer before the connection can be established. Once you've signed into the apps on both ends, you're ready to initiate hassle-free file transfers in either direction. 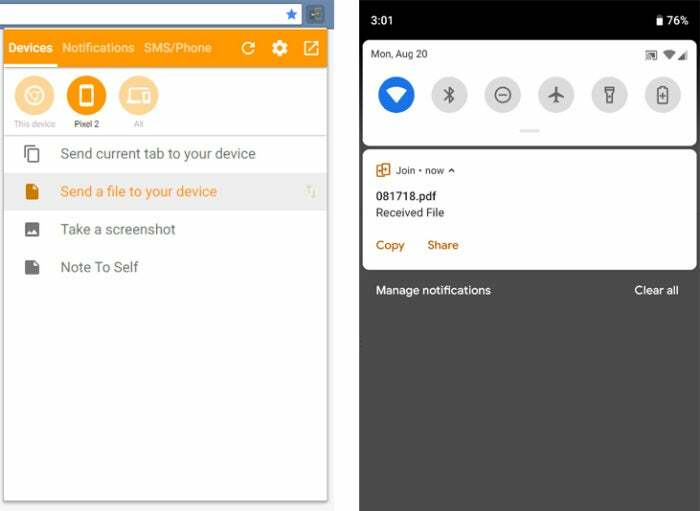 On Android, just share a file from any app — a file manager, an image gallery or any other sort of file-using utility — and select Join as the destination. The file will appear on your desktop within seconds. Drop a file into Join on your desktop (left), and it'll appear on your Android device a second later (right). Join has a bunch of other functions, including the ability to create a common clipboard for your desktop and mobile device — so you can copy text on one system and then, without any additional effort, paste it anywhere on the other — but even if you just use it for wireless file transfers, it's well worth keeping around. The app comes with a free (ad-supported) one-month trial and then requires a one-time $5 purchase if you want to keep using it. Believe it or not, this is actually quite easy to pull off. Just grab a $3 app called FolderSync Pro. It'll let you create pairings between a local folder on your phone and a cloud-based folder — with support for a huge array of cloud storage services, including Dropbox, Google Drive, OneDrive and Amazon Cloud Drive. Install the appropriate computer-side app for whichever service you prefer, make sure it's set to sync with your computer's hard drive — and there ya have it: Your Android device's folder is now effectively part of your PC. Next up: Make sure you understand the ins and outs of Android backups. They're ultimately made up of files, too, after all — and pretty important ones, at that.